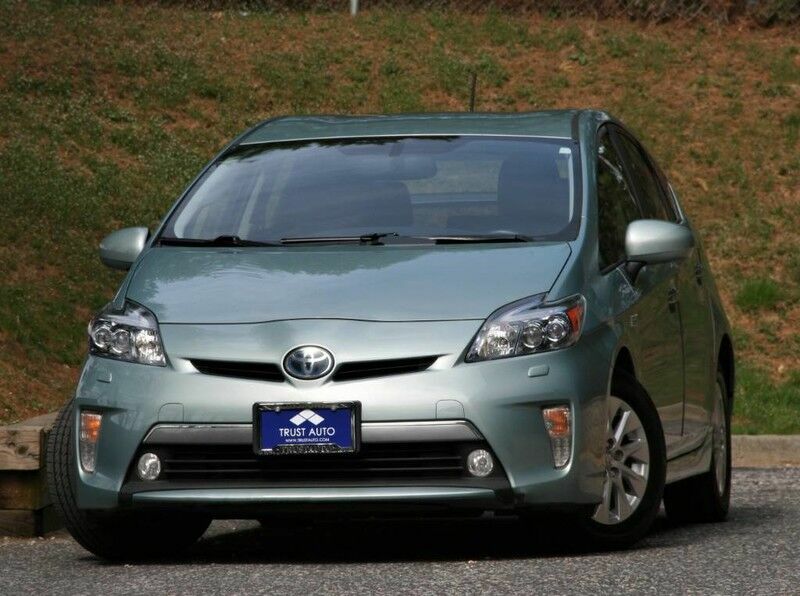 Check out this gently-used 2012 Toyota Prius Plug-In w/ Advanced Package we recently got in. How to protect your purchase? CARFAX BuyBack Guarantee got you covered. CARFAX shows that this is a one-owner vehicle -- no wonder it's in such great condition. This vehicle was engineered to be both economically and environmentally friendly with exceptional fuel efficiency. You can tell this 2012 Toyota Prius Hybrid Plug-In has been pampered by the fact that it has less than 89,637mi and appears with a showroom shine. Added comfort with contemporary style is the leather interior to heighten the quality and craftsmanship for the Toyota Prius Plug-In Feel at ease with your purchase of this Toyota Prius Plug-In Advanced, all records are included allowing you to truly know what you're buying. Adjectives like impeccable, spotless, and immaculate can be used to describe how clean this Toyota Prius Plug-In Advanced is, causing it to feel more like a new vehicle than a pre-owned one. Price. Performance. Protection. This vehicle has it all, including a manufacturer's warranty. Engineered with the latest in technology and features, this vehicle is an automobile lover's dream. This vehicle comes with a navigation system. That doesn't mean you won't get lost. But it does mean you won't stay lost. The paint and body on this Toyota Prius Plug-In Advanced looks as fresh as the day it rolled off the assembly line. Sophistication, performance, style and class all wrapped up in this rare Toyota Prius Plug-In. More information about the 2012 Toyota Prius Plug-In: The Prius has set the standard for hybrid-powertrains in the US since it was introduced. The current model is the most efficient, most reliable Prius yet and starting at $22,120 before tax rebates and incentives, it's an amazing bargain. With several new Prius variations on the way, the winning hybrid powertrain will be available in more body styles to appeal to more car buyers. Anyone who thought the original Prius was too small should look for the Prius v. Customers looking to maximize their fuel economy would be advised to consider the Prius Plug-in. Both feature Toyota's reliable, efficient hybrid technology at a reasonable price. This model sets itself apart with proven reliability, new models provide cargo and passenger flexibility, and Leading fuel economy *30 DAYS / 1000 MILES POWER-TRAIN WARRANTY INCLUDED (ENGINE, TRANSMISSION, DIFFERENTIALS)* *TRADE INS ARE WELCOME* Trust Auto is one of the top pre-owned vehicle dealer in Maryland. We provide quality vehicles of various makes and models with the most competitive prices in the region. Trust Auto is dedicated to make your vehicle shopping experience hassle free and straight forward. With that in mind we fully inspect, service and detail all cars in the lot. We are open 6 days a week now FOR YOU!!! Monday - Saturday 9am - 7pm. Some vehicle information and pricing may be unintentionally missing or inaccurate, and Trust Auto will endeavor to correct such discrepancies in a commercially reasonable manner after being notified of any errors. Pricing errors and listing errors are considered invalid and may not be honored at the sole discretion of Trust Auto. Prices subject to change without notice and do not include Title, License, Registration Fees, State or Local Taxes, $895 PDI & $299 Dealer Processing Fees. Please contact seller for vehicle availability. All vehicles with PDI are sold with a 30 day / 1,000 mile warranty! EPA mileage estimates are provided for comparison purposes only. Actual mileage may vary depending on driving conditions, driving habits, and vehicle maintenance. Mileage listings are estimates and are not necessarily accurate odometer readings.